A little under two thousand days ago (is it really that many? ), I snapped my wage slave chains and took early retirement from the public service. It hadn’t been planned, though I was of an age to leave, but it was a sudden opportunity that presented itself that was just too good to ignore. Even on that last day in service, as I strolled the streets of Paris with my birthday girl of a wife on a balmy spring day, I gave little thought to what I might do next, to what my “second career” might be. After all, I was only fifty six – “nobbut a bairn” as they’d say in Yorkshire. Cue excuse to post a gratuitous photograph of myself on that fateful day. Too young to retire? (Don’t answer that one). And now I am about to return to gainful employment for the first time since. There was no rush to find alternative employment at the time – I had a decent occupational pension, though hardly the golden handshake that many believe awaits anyone, irrespective of finishing grade or length of tenure, that leaves the civil service. And it would be another eight and a half years before I was eligible for my state retirement pension. But I received an income that supplemented my wife’s continued full-time salary (she would have, barring a lottery win, another eight years before she could follow suit). Once a handful of debts had been paid, the residual lump sum could sit in a savings account growing ever fatter with a 0.5% interest rate. Although the process of offer, acceptance and departure was a swift and painless one, there were sound personal and professional reasons for my decision. I was becoming increasingly disenchanted with the commercial and less caring direction in which the organisation was moving, and felt unappreciated by immediate line management and employer alike. When I added in twenty three years of long distance commuting, I’d had enough. It “helped”, if that’s the right word, that my father was not in the best of health, and I could now devote more time to his care. And my wife would have her dinner on the table every night when she got home from a ten hour day. But back to the question of what to “do” next (as if caring and maintaining a home were “doing” nothing). My preferred part-time job would have been working in a bookshop, but they were already dropping by the wayside in the face of the economic downturn and e-book onslaught. Book selling had been a long shot anyway, but surely, working in travel and tourism, for which people told me I had a passion and aptitude, would be a better bet? So I wrote to around twenty travel agents in the area, extolling the inestimable benefits I could bring to their company. My education in what happened in the brave new, recession-ridden, non-governmental world of work was expanding daily as my letter box grew rusty with misuse. I soon realised that, in order to compete for a career in tourism at any level, especially given my age, I would need to “go back to school” and acquire some vocational qualifications. Time was too short to embark on a three year degree course to become a tour guide – for which there were few openings anyway – so I plumped for working towards a prestigious professional diploma from the Home Learning College. Within a year, I had passed with distinctions in all three elements of the course. But jobs were still at a premium. And, by then, having prepared fourteen dissertations, I had rediscovered a long term itch that screamed to be scratched – writing. There was nothing else I wanted to do. It wasn’t going to pay, at least in the short term, or possibly ever, but it would be the most fulfilling and satisfying thing I could do with my time. I started a blog on New Year’s Eve 2010, focusing principally on my affection for San Francisco, which I maintain to this day – the blog and the affection of course. In 2013 I published, along with Martin Moseling, my first book, A Half-Forgotten Triumph, which received critical acclaim, but modest sales, in the admittedly niche world of cricket writing. My next book, Smiling on a Cloudy Day, which will attempt to articulate my love for the City by the Bay, is scheduled for publication in the summer of 2015. I believe that, on the whole, I have managed my time away from the world of “working for the man / woman” over the past five and a half years fairly effectively. And I have certainly never been bored. In fact, how did I ever find the time to go to work? Do I regret having “retired” when I did? Have I missed the social interaction, the camaraderie of working in a team, the sometimes unbearable stress? But now an opportunity has arisen that has made me reconsider whether my fierce commitment to customer service, a trait known only too well by my wife as she listens to yet another Victor Meldrew-like rant on the subject, might yet have an avenue of expression outside the home. Which brings me neatly back to the new job. A high-end, award-winning cookware company is opening its new state-of-the-art branch in Bluewater, Europe’s largest shopping centre, in October, and I have been successful in securing a part-time position as a sales assistant. As with my early retirement, the process of sending my CV, being interviewed and offered the job took just three working days. It’s not my first venture into retail – I worked for six months in a local charity shop in 2010 which I enjoyed immensely, though I acknowledge that this will be a far more intense working environment. Although I had essentially given up on returning to such work, I find myself intrigued and not a little excited at the prospect. It will mean, of course, managing my writing and other responsibilities more rigorously. And spending less time on Facebook can be no bad thing can it? But my wife will have to make her own dinner when I’m on an evening shift. 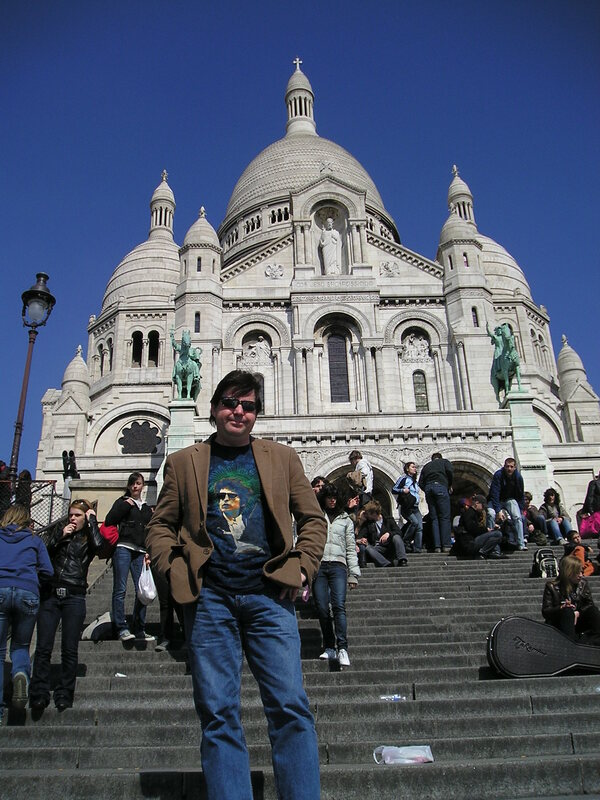 But oh to be back in Paris in 2009! (Another gratuitous photograph).